I can’t believe we are nearing the end of July already! Where is the summer going?!?! I’m SO not ready for the seasons to shift again, so I fully intend to soak up the last month of summer! What are your plans? 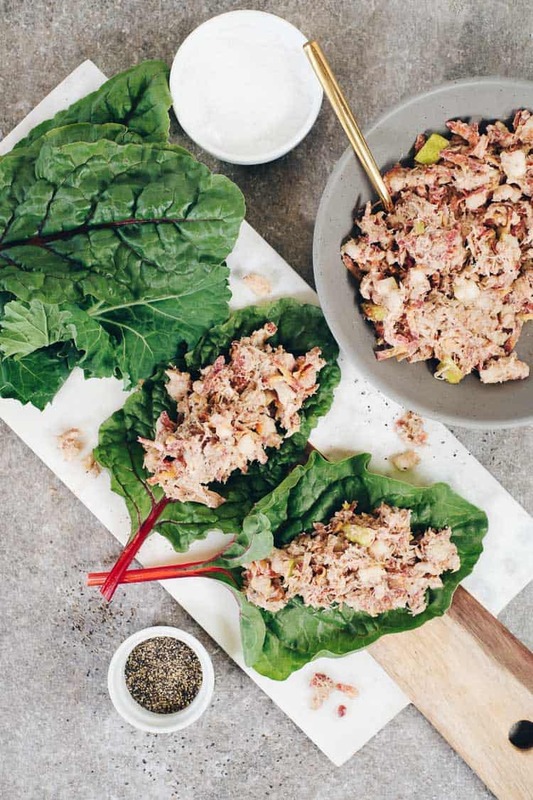 If you’re going to be busy like us, make sure to make these pear and almond chicken salad wraps! They are perfect for packing along for a day trip or lunch during the busy week! We love simple meals that are flavorful and a breeze to make! 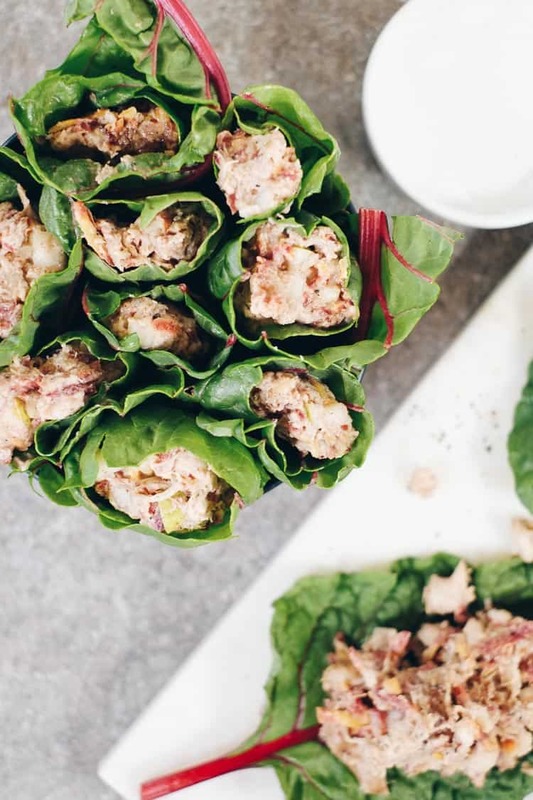 These pear and almond chicken salad wraps are super easy to make and full of unique flavor! 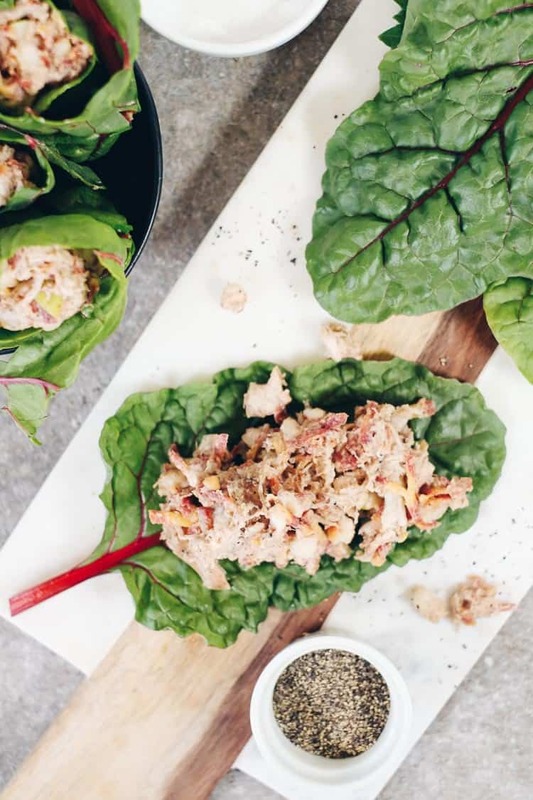 These are not your average, boring chicken salad wraps. They are sweet, tangy, and delicious. The best part is, you just need a crockpot or instant pot and some simple ingredients to make them. Once the chicken is done cooking, simply shred it with a fork and then combine it with the rest of the ingredients. Slop it on some greens and roll it up! Done and done. You can use any broad leaf greens that you like. We had a bunch of Swiss Chard growing in the garden that we used when we made this for the photos in this post, so that’s what we used. You could just as easily use romaine, kale or butter lettuce. Go with whatever greens you love! 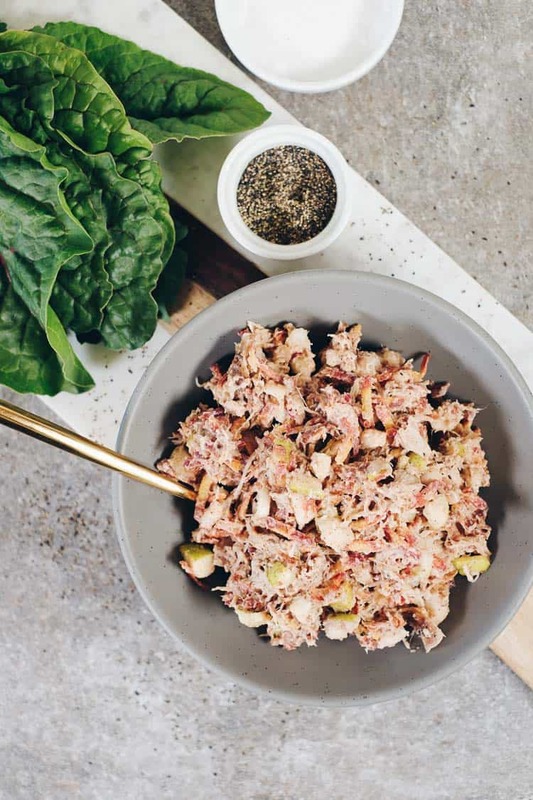 The best part about these pear and almond chicken salad wraps are that you can make them over the weekend to have on hand during the busy week. They’re great for taking to work for lunch, or if you have busy weekend plans, they’d be perfect for packing to take with you! 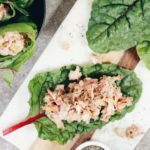 Go ahead and make these chicken salad wraps a part of your weekend meal prep to have an easy meal on hand. Let us know how it goes by leaving a comment below. Also, take a photo and tag us on Instagram @realsimplegood, so we can check it out! 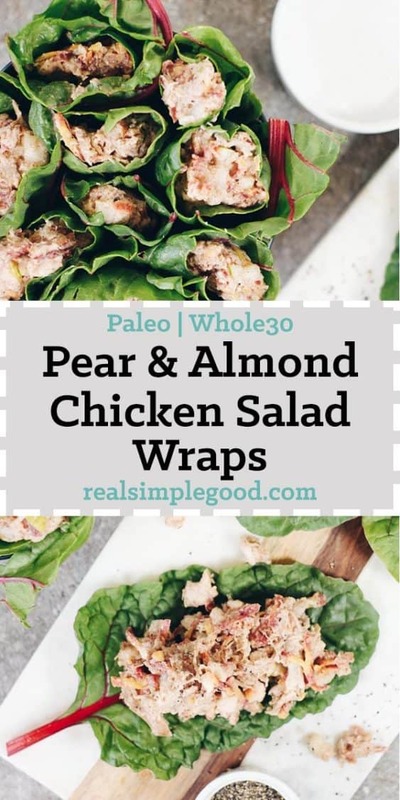 These Paleo and Whole30 pear and almond chicken salad wraps are perfect for packing along for a day trip or lunch during the busy week! Place all of the chicken ingredients in the crockpot or instant pot. Cook in the crockpot on low for 6 hours or on high for 3 hours. In the instant pot, cook on the manual setting for 20 minutes. Once the chicken is done in either the crockpot or instant pot, shred it with two forks and drain the broth. To make the chicken salad, prep the pear and carrots as noted and place them in a bowl. Add shredded chicken, almond butter, fish sauce, lime juice and vinegar. Mix well to combine evenly. Now, make your wraps. Place some of the chicken salad in the lettuce, wrap it up and enjoy.